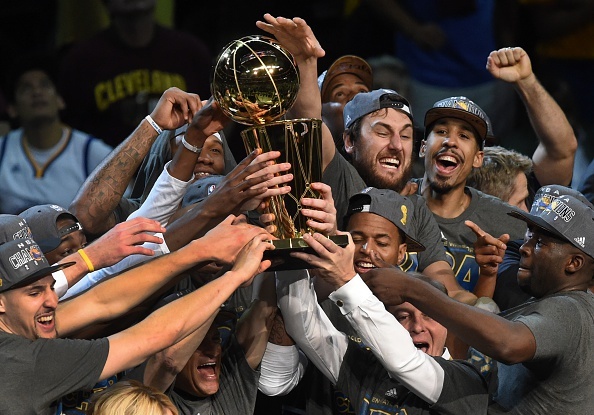 The Golden State Warriors, who had the best record in the league during the regular season, a record that gave them 67 wins, tied for fourth most all-time with many others, are your 2015 NBA Champions. And while the series went six games, it wasn’t even close. There was no doubt, at any time in this series for me, that they’d lose it. The Cavaliers were just too depleted. They lost Kevin Love in the first round against Boston. Then, in overtime of Game 1, lost Kyrie Irving for the rest of the series with a broken knee cap. That forced Matthew Dellavedova into the starting lineup, who’s stardom lasted for about two games. Golden State didn’t win this series like we expected them too. Stephen Curry struggled early, with Dellavedova harassing him in Games 2&3. Game 2, probably Curry’s worst game (19 points, 5/23 FGs, 2/15 on threes), was where Delly’s fame began. And in Game 3 it took off. Curry finally found his game in Game 5, where he dropped 37 points and was 7/13 on threes. By then, Delly was exhausted after playing his heart out in games beforehand. The problem: Cleveland just didn’t have enough depth. That’s not an excuse. It may be the reason they lost, but it’s not an excuse. There were ways the Cavaliers could have forced Game 7. First, they turned the ball over 16 times in Game 6, and as we know, Golden State kills everyone in transition. Secondly, the Cavs only had 14 team assists, continuing the iso-ball play they used earlier in the series and playoffs. There’s another case. After Kyrie Irving went down, Lebron James was all this team had. And boy, did he play his tail off. His averages during these Finals: 35.8 points, 13.3 rebounds, 8.8 assists. Bottom line: Ridiculous. And it still wasn’t enough. While Golden State didn’t play their traditional game, they still backed me up, because the Warriors can beat you in so many different ways. And while only two of the four ways I laid out were present, they switched lineups and game-plans. They finally made shots. They still got it done. It’s just one of many ways that makes this team so special. Really, in my opinion, I’m not sure there was a clear MVP. Now, had Cleveland won, Lebron would have unanimously gotten it. There were 11 votes. Seven went to Andre Igoudala. Four went to Lebron. I don’t think Lebron would have accepted it had he won in a losing effort. He’s not that type of player. Iggy, the MVP, came off the bench all year, contributed nicely, and gave them some leadership. But then Golden State found themselves down 2-1 in the series, and decided to bench Andrew Bogut (who was already getting destroyed by Timofey Mozgov) for Iggy. The move slid Draymond Green to center, where he was still killed by Mozgov. However, the small-ball lineup gave the Warriors more shooting, and more athletic players on the perimeter. After that move, Cleveland never won again, even with their own effort in copying the small-ball lineup. Even though this series went six games, it really seemed like the Warriors dominated. While the traditional winning ways of the Dubs weren’t present, they found new ones. They made it happen. Did you really have any doubt? Alright, this is just ridiculous. During the span of these Finals, we’ve had two major trades take place around the league. I’m gonna break-down both. I copied and pasted İlyasova.. I also learned how to pronounce it…. So, my main takeaway from this trade was that the Pistons know or fear they’re losing Greg Monroe in free agency this Summer. İlyasova is a stretch four, which’ll be a nice compliment to Andre Drummond. Drummond is a classic center, who’ll grab every rebound there is, but won’t be super physical in the post. After losing Larry Sanders early in this past season, the Bucks were forced to play Zaza Pachulia at center, a set-up that didn’t bode too well together. Clearing out İlyasova’s salary give the Bucks a ton of cap-space, up to $22 million this Summer. There’s been rumors about what they have in mind, but I have a certain solution that won’t give Jason Kidd nightmares about what to do down low. 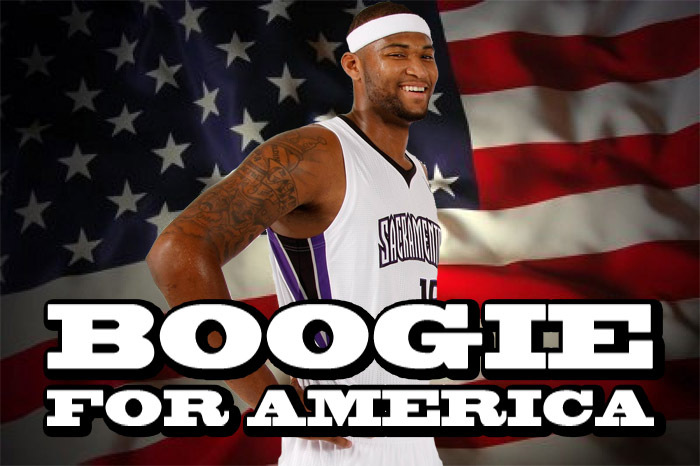 DeMarcus Cousins’ (BOOOOOOGGGGGIIIIIEEEEEEE!!!!!!!!!!!!!) frustration with the Kings has been high for awhile now, rightly so. He’s played with countless coaches and point guards, and has one crazy owner. Trading Boogie is something the Kings might have floated before. Certain people see Milwaukee as a team that would fit; others see the Magic and Celtics as possible contenders. A trade to the Bucks could look something like this (plus picks.. ESPN Trade Machine doesn’t allow picks to be moved). Vivek Ranadive probably has daydreams about Giannis Antetokounmpo.. and Deron Williams, and Rajon Rondo, as he does bunch of other guys. The Kings don’t need anymore wings, but it’s not like Vivek would care. Vivek doesn’t care about how many players he has at certain positions. Seriously! He took the same player in the draft two years in a row! And it might be three including this year (more on that later)!!!! Anyways, the Bucks moving İlyasova foreshadows something. Not quite sure what it is yet. Well, this was a nice surprise during Game 6 of the Stanley Cup. Even though I never even heard about it till the morning after. Don’t ask me how. I mean, I’m usually on top of things, even while other games are on, but I never saw this Monday night. Anyways, I think this is gonna be a disaster both ways. Charlotte desperately needs a wing, and Barnes gives them that. However, he’s quite sketchy, and has a bad attitude. He’ll be a nice fit, but now we’re not sure if he’ll even play for the Hornets, as rumors of them waiving him are swirling. Here’s my question: Do the Hornets really think that Spencer Hawes is more valuable than Matt Barnes? Charlotte already has big guys; it’s not like they’re short on them. And did they see Hawes play this past season? Yeah, not great! What the Hornets got back suggests one thing: They really, really wanted to get rid of Lance Stephenson. After signing a three year, $27 million contract last Summer with Charlotte, he averaged 8.2 points a game, and shot 37% on field goals… Plus an ugly 17% from three. It just never worked out there, and I’m not sure it’ll work out in Los Angeles. First of all, that Clippers team doesn’t need anymore bad personalties, but that number will drop if DeAndre Jordan leaves. Secondly, a Chris Paul/Lance Stephenson backcourt seems like a problem. I can’t totally wrap my head around it yet, but it may be the Clippers’ best interest to let DeAndre walk, which would give the backcourt more room to work, space the floor, and fit. It’s way too early to really dig into it deeper, but these two trades clear up some Draft stuff, and gave the media even more NBA to talk about on off days. Their search took forever, and I’m glad it did. Rather than hiring Mike D’Antoni or Melvin Hunt (now hired as an assistant in Dallas), Denver went with someone who’ll be in it for the long haul. After inexplicably getting fired by the Kings this past season, Malone comes into Denver with a lot in his control. Look, this isn’t a situation where he’ll try to make this roster work again. There’s gonna be guys getting shipped out this Summer (Ty Lawson, Kenneth Faried (maybe)). This is a re-building project with the Nuggets. They might just trade everyone expect Jursuf Nurkic and whoever they draft. It’s a large task that Malone has, but he’ll have a much longer leash this time. On how the first four picks of the NBA Draft may work out…. I know, I know. You’re probably thinking “But, you didn’t cover college basketball this year! What do you know about these prospects?” Just because I didn’t write about a sport, doesn’t mean I don’t watch it. I watched college basketball this year. I watched enough to put together a mock draft of the first round, which is still in progress and will be out next week. Now, maybe I didn’t watch enough college basketball to fill out a decent bracket, but then again, this past year’s tournament was ridiculous. The top four spots in this Draft could go a lot of different ways. I’m gonna lay out certain scenarios, and then will make up my mind in my mock draft next week. There’s four scenarios with these top four picks. It might get a bit complicated. FYI: I believe these four players will be the top four picks. That won’t change. This is the scenario that the people in Vegas like. It’s basically sharpie based on Big Boards. Most insider people believe that the Timberwolves’ front office likes Karl-Anthony Towns, but that Head Coach/GM Flip Saunders likes Jahlil Okafor and Owner Glen Taylor likes D’Angelo Russell. So yeah, it’s a bit of a cluster. Minnesota seems to be in best player mode. The Wolves are gonna get better; it’ll be awhile before they actually contend though. I believe that the Wolves haven’t given up on Anthony Bennett playing power forward, the 2013 No.1 overall pick who they got in the Kevin Love trade with Cleveland. If that’s the case, they take Okafor at No.1, keep Bennett, and ship Nikola Pekovic to Phoenix or something (homer alert). If the Lakers miss out on D’Angelo Russell, then they’ll probably over-pay Rajon Rondo this Summer. The scenarios aren’t in any order of probability, FYI. Look, there’s almost no way Towns falls to the Knicks at four, but if he does… ZEN MASTER STRIKES AGAIN. The Lakers don’t need a power forward in Towns; they took Julius Randle last year at No.7 overall. Russell makes all the sense in the world for the Lakers, and it wouldn’t force them to over-pay Rondo this Summer. He’s a true point guard, though he is tall like Muiday. But man, Russell can score. That’s the type of player the Lakers need. It’s the same situation with the 76ers. That team is loaded with big men, and need much help in their back-court. Mudiay seems likes a Michael-Carter Williams 2.0, just in the case that they’re both very tall for their position. Hopefully, Mudiay will succeed wherever he ends up, as MCW has failed to do. Again, this scenario is so not happening… But then again… ZEN MASTER. So, if Minnesota does what most people expect them to do, and take Towns, it locks in Okafor for No.2 to LA. The Lakers love him already, and seem to have their heart set on him. I don’t think Philly is gonna want to deal with a MCW 2.0, so they’ll go with a scorer, who’ll get to the bucket and’ll run pick-and-roll with their big men up top. The Knicks are the juggernaut in this whole thing. They’re considering a wide-range of players. Sure, they’re in best player mode, but certain guys are standing out to them. And some of those they would be able to snag later in the Draft. They’re the most likely candidate to make a trade, whether it’s up or down. It’ll probably be down if it happens, but I have no clue who’ll want to trade up. Scenario No.4: TRADE AT THE BACK END!!! The Timberwolves have reportedly been shopping Ricky Rubio around, and the most likely trade I can think of would be a swap with Dallas for No.21 overall. Dallas is guard needy, as they’ll probably lose Rondo and Monte Ellis this Summer to free agency. A straight up swap of Rubio for No.21 would give the Wolves another first-rounder, which they could use on local kid Tyus Jones. Jones, the MVP of the Final Four. It would essentially replace Rubio at point guard, and would generate a ton of excitement around the Twin Cities. Tyus went to high school 20 minutes South of my house. Everyone loves him here, and he’s highly respected in the community. I’m not saying it’s gonna happen, but it sure would be cool. I’d love to see the Kings take Justice Winslow just so we can see how crazy Vivek is for taking the same player three years in a row. If the Kings take Willie Cauley Stein at No.6, then.. well… I covered it above. I had Sam Dekker going very high before the Lance Stephenson trade. I’m really liking Christian Wood out of UNLV. I think the back end of the first round is gonna be big man heavy. Justice Winslow is gonna go top seven. Guy is special. I don’t expect any movement in the top three.